Frothed milk when warmed makes coffee taste sweeter because milk sugars break down with heat. This sweetness provides a complement to coffee’s bitterness. Play barista at home with a milk frother and make foamed milk to top off espresso shots to make cappuccinos or add to your regular cup of joe. With a milk frother, it's easy to whip up that café-grade, thick layer of milk--whether cow or soy--in your kitchen. There are three different kinds of frothers to consider, ranging from low tech to high tech. Our guide breaks down what you need to know so that you can find the best milk frother for your java needs. The least expensive type of milk frother is the handheld whisk. Fortunately, it's not the wire, no-tech whisk that may have been a staple of your kitchen growing up. We're talking about a battery-operated gizmo that does all the whipping for you. So save your biceps and wallet with this device that typically runs $20 or less. A handheld whisk is easy to use and easy to clean up. Just immerse the frothing tip directly into your saucepan or milk container and wait a minute or two for the milk to foam. Rinse the frother off with soap after use. Another inexpensive milk frother is the pump frother, which will run you between $15 and $20. This stainless-steel or glass pitcher comes with a lid and plunger. You have to heat your milk separately before pouring it into the pump frother. You then simply pump the plunger up and down, which requires some hand and arm strength, to froth up the milk. This is ideal for making one or two cappuccinos, whereas a handheld whisk can foam up a bigger batch. An electric milk frother is more expensive, ranging from $30 to $50, though some can cost over $100. All you have to do with these carafe-like appliances is plug them in, pour in your milk, and press start. Then voila: your milk has been whisked up to a perfect foam. We recommend an electric frother that warms up your milk in addition to frothing it. These are incredibly easy to use, though not as easy to clean as the other types of milk frothers. Q. Can I use alternative, plant-based milk with milk frothers? A. It's easiest to froth cow or goat milk because of their higher protein content. Soy milk has almost as much protein as regular milk, so it froths almost as well, but almond or rice milk won't really froth sufficiently for a cappuccino. Q. Do I heat up my milk before or after frothing? A. We recommend warming your milk as soon as you finish frothing. The ideal temperature is around 140° to 150°F. Q. Do frothers steam milk as well? What is the difference between steamed and frothed milk? A. Frothed, also known as foamed, milk is actually different from steamed milk. Though made in a similar fashion, steamed milk is used in lattes and isn't as heavily whipped as frothed milk. Baristas use steamed milk to create those intricate designs on lattes. Frothed milk has been whisked rapidly to create microbubbles that increase the volume of milk. Frothed milk is used for cappuccinos. There are some electric frothers that make both steamed and frothed milk. Our take: For a top-of-the-line electric milk frother, search no further than this gorgeous stainless-steel model from a quality and trusted manufacturer. An investment for your kitchen, this frother delivers results, looks, and versatility. What we like: We love this frother's high capacity (up to three cups) and fast operation. You can make hot or cold beverages with its adjustable temperature control. It also makes milk specifically for cappuccinos or lattes. What we dislike: Because of its spacious capacity, this frother is not ideal for making single servings. It's also a bit noisy. 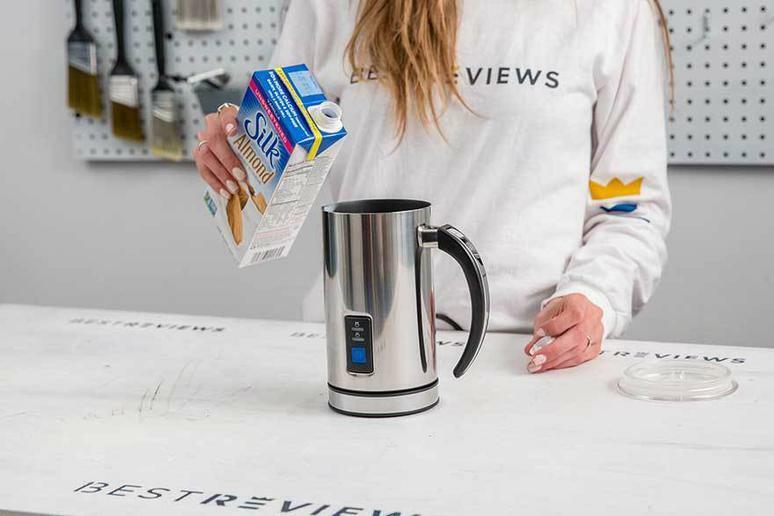 Our take: This electric milk frother effortlessly--and inexpensively--froths milk in a sleek, stainless-steel carafe that looks great on your kitchen counter. What we like: This frother can foam milk hot or cold, so it works for iced coffee drinks, too. It also has four density settings, a high-end feature that's a steal at this price point. What we dislike: This milk frother can tend to overflow from the spout when heating. Be careful to only fill it at or below its 4.2-ounce capacity. Our take: This is a great handheld option for professional-grade frothing. Its battery-operated power whips up froth quickly, in 20 to 30 seconds. What we like: This milk frother generates a high volume of froth: up to one cup when using low-fat milk. It also comes with a five-year warranty. What we dislike: As with all handheld milk frothers, it does not warm up the milk.